If you slip the ATIV Book 9 Lite NP915S3G-K01 from your bag during a meeting, we can pretty much guarantee you'll be the center of attention in the minutes that follow as people clamour in for a closer look. The ATIV Book 9-Lite is impossibly slim, its clean profile looks beyond cutting edge and it deals in envy like a professional Vegas card shark. The ATIV Book 9-Lite comes in any colour you'd like, so long as it's black or white. The Windows 8 touch screen adds to this notebooks' mystique, enabling seamless interaction with the operating system and your favourite apps with the swipe of a finger or two. Heck,during the few weeks we tested the ATIV Book 9-Lite hands-on in the PCSTATS labs, colleagues were continuously flocking over to check it out! However, as much as I want to like Samsung's ATIV Book 9-Lite, I'm conflicted. Stylistically, it's awesome. In terms of performance, the benchmarks tell a story at odds with its alluring appearance and if you dig deeper, the tech specs do hint at the limited infrastructure within its svelte 17.5mm thick chassis. Since PCSTATS is all about "getting the 'stats and staying informed" let's swing back to the critical eye of reality. 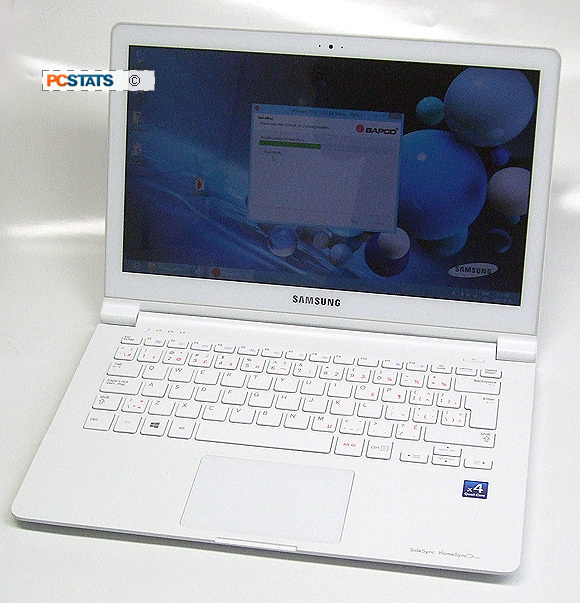 In the system level benchmark Sysmark 2013, Samsung's ATIV Book 9-Lite falls 71% behind the Samsung 900X4C-A02 Ultrabook. In 3DMark Vantage, the ATIV Book 9-Lite's Radeon HD 8250 integrated graphics perform 61% behind the Samsung 900X4C-A02 Ultrabook's anemic Intel HD4000 IGP. In other words, the ATIV Book 9-Lite is an entry level notebook, a sheep in wolf's clothing if you will. The $892 ATIV Book 9-Lite is suitable for everyday office tasks, websurfing, email and such, but it clearly straddles the fence between tablet and entry level notebook. 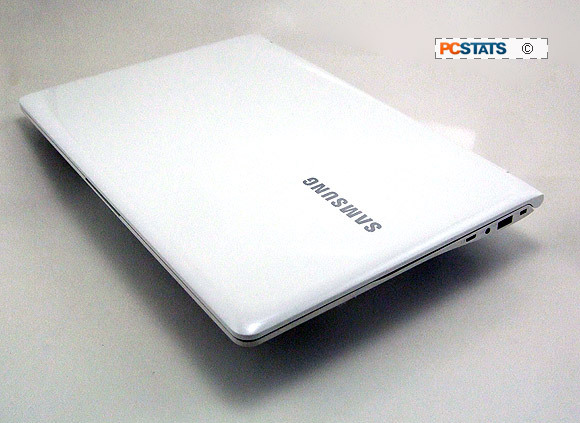 It's certainly not in the same league as the similarly looking, $1600 Samsung 9-Series 900X4C-A02 Ultrabook. The quad-core AMD Kabini processor is an entry level mobile chip, perhaps this is why Samsung chose not to disclose the make and model of CPU powering the ATIV Book 9-Lite. On the surface, a 128GB SSD for storage and 4GB of DDR3 system memory seem standard, but the memory is soldered to the motherboard (thus not upgradable) and with OS and recovery partitions the SSD gets whittled down to 100GB of usable space. If you want to upgrade the mSATA SSD to a larger module, a 256GB mSATA SSD runs about $200 and a 480GB mSATA SSD from Mushkin will be closer to $500. On the plus side, Samsung's ATIV Book 9-Lite is extremely portable, doesn't weigh much and has a comprehensive bundle of wireless connectivity. The computer weighs a little over three and a half pounds and folds up to a package less than three-quarters of an inch thick. That's 1.58kg and 17.4mm respectively for the metric crowd. With Windows 8 x64 operating system, 4GB of DDR3 RAM, a 1.4GHz quad core AMD Kabini APU under the hood, the ATIV Book 9-Lite is suitable for light computing needs. The 128GB SSD offers 100GB of usable storage space, depending on how many applications you load onto the ATIV the speed and responsiveness of that small SSD may quickly become outweighed by the desire for significantly larger storage capacities provided by a full fledged notebook. 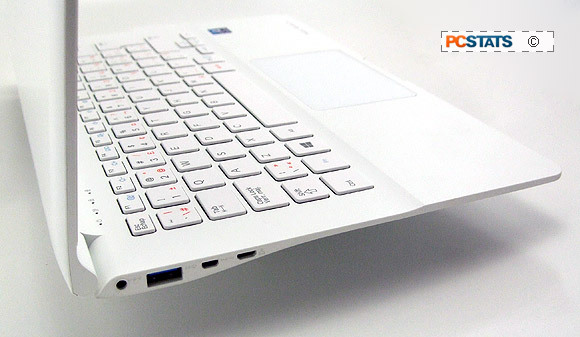 The ATIV Book 9-Lite would make a suitable computing device for taking to class; it boots up in under 10 seconds and the combination of keyboard, touch pad and touch screen make it more versatile than a tablet for rapidly entering data or opening PDFs and other documents. On the port front, the ATIV Book 9-Lite offers up two USB jacks, two video outputs (micro-HDMI, mini-VGA), a SD memory card reader, a headphone/mic jack and a mini-Ethernet connector. At least one port is USB 3.0. The trap-door memory card reader (SD/SDHC/SDXC) is a nice addition, the combination headphone/mic 1/8" audio port and web camera ensure mobile conferencing can go off without a hitch, however the VGA, HDMI and Ethernet outputs are relegated to micro connectors which all require dongles or miniature cable connectors. The 13.3" touch screen LCD display is bright and expansive from head on, its resolution of 1366x768 pixels is more than sufficient at this panel size. Viewing angles are satisfactory for a notebook of this class, great from head on but narrow if you're more than say, 30 degrees off from center. One surprise with the ATIV Book 9-Lite is how far the screen will tilt back. Most laptop screens can't fold back 180 degrees, the ATIV Book 9-Lite will essentially lay flat on a table top so multiple users can interact with the touch screen. Typing on the flat Scrabble tile keyboard is comfortable and the touch pad with integrated click pads is easy to interface with. As we've revealed, under the hood is a 1-1.4GHz AMD quad-core processor paired with AMD's H55M chipset. The 28nm CPU is based on AMDs 'Kabini' core architecture and draws just 10W of power, although Samsung don't disclose the exact model this CPU looks to be AMD's A6-1450 APU. Graphics are handled by AMD's integrated Radeon HD 8250 graphics core. The Radeon HD 8250 possesses 128 Radeon cores which are clocked at 300MHz - 400MHz. Radeon IGPs are usually pretty decent, the HD 8250 offers luke warm 3D gaming, at best. Battery life is pegged at 5.5hours. The 30Wh Lithium Polymer battery recharges in about 2 hours. Samsung's ATIV Book 9-Lite NP915S3G-K01 retails for around $829 USD/CDN . Given what PCSTATS experienced while testing the Samsung's ATIV Book 9-Lite NP915S3G-K01 it's hard to know where to stand in our recommendations.... 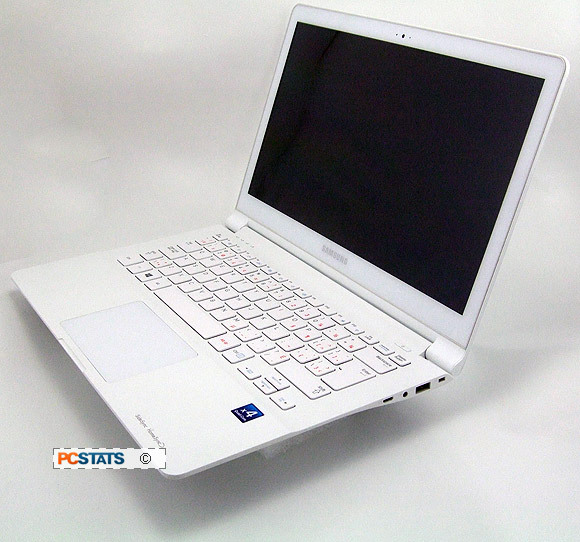 Benchmark results peg the ATIV Book 9-Lite as an entry level platform, but in use it doesn't feel incumbered at all. Under the hood the CPU, SSD hard drive and wireless hardware are good for this class of mobile computing. Ultimately, if you've been searching out a light weight mobile platform because tablets are "too limited", but you like the quick start time and good battery life they offer, you'll find the Samsung ATIV Book 9-Lite a better deal and more flexible than any tablet. On the other hand, if you want an Ultrabook style notebook, or a powerful and thin notebook, the ATIV Book 9-Lite simply won't meet your expectations and you're better off looking elsewhere.